Home milk delivery has been an available service for much, much longer than there has been dairy software to help manage it — truthfully, we’re not sure how local milkmen got from Point A to Point B in the 18th century, but we’re glad they did. As we’re sure you know, milk home delivery services took a major hit in the mid-1900s when grocery stores were able to incorporate refrigeration systems and ice boxes in-store, allowing them to store and sell milk in cheaply plastic jugs. Though, milk delivery and small-dairy milk sourcing have become more and more popular for families wanting to know where their milk comes from and those who are concerned about animal welfare at large dairies. This is good news for local dairy producers, however, there is still some work to be done. While word of mouth may have been sufficient enough marketing for dairy farmers in the 17- and 1800s, these days consumers want something more efficient and reliable. If your customers cannot easily navigate your website, schedule deliveries, and pay online, they are likely to move on to the next local dairy’s website where they can do that. Once you get their business, it is imperative that accurate deliveries are made on time and that their returned bottles are accounted for and credited to their account. That’s where Delivery Biz Pro (DBP) comes in. When you choose DBP as your dairy software, you get so much more than just a software; you get a customized experience. Delivery Biz Pro’s services include a beautifully designed customer marketplace that easily allows customers to edit orders, add recurring items to their cart, and pay online over a secure server. On this marketplace, you can offer promotional sales, send automatic order confirmations via email, automatically text customers when their order has been dropped off, send out birthday discounts, and so much more. With a suite of admin tools, you have complete control over how your website is run. Do you want items to disappear from the site or have an “out of stock” label when the available inventory is spoken for? Do you want customers to see related items when they add a specific product to their cart? All of this can be easily done through the backend of the website in order to give your dairy business an edge over the competition. 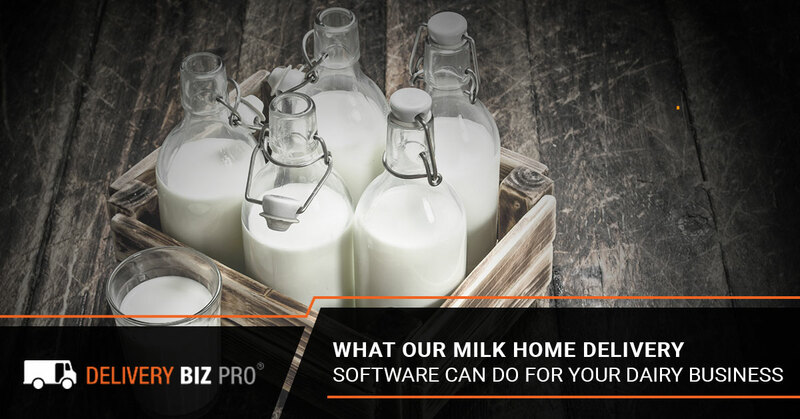 So, what makes DBP different than other dairy delivery software solutions out there? For starters, we pride ourselves on having the most customizable and easiest to use software available. If you’re paying for a software, you shouldn’t have to also pay for someone to interpret a bunch of confusing data and troubleshoot problems. That’s what we’re for! Our in-house team of IT professionals takes care of security and server updates for you, and your data is housed on its own dedicated server (meaning no one else will slow your site down) and is backed up twice daily. We want you to be able to forget about the technical side of things and focus on providing an excellent product knowing your data is safe and recoverable if something were to happen. Our software is designed to make things easy for your customers, but don’t worry, we didn’t forget about your team. As a home delivery software, it is our goal to ensure that your drivers are empowered on the road and that routing is done in a way that makes sense for your business. Automatic routing can happen in multiple ways based on the needs of your business, drivers, and customers. With the click of a button, you can automatically assign customers to routes, create new routes by drawing circles on a map, and assign customers to multiple routes if needed. You can even break up routes by day of the week if you’re sending out daily deliveries. Drivers can use our touch-screen tablets to collect signatures, mark bottle returns, edit orders, and take payments on the road. Drivers can also change the routes using a drag and drop feature if they need to avoid construction or change the delivery routes based on physical distance between drop-offs or driving time. Jonathan perfectly captures both sides of our software: The customer side and the administrative side. We don’t want your customers to ever wonder if their order went through or if the product they just put in their cart is actually going to make it to their doorstep. At the same time, we want you to know where your business stands in terms of sales and deliveries. Through years and years of developing this software, we have found the perfect melody of customizable administrative tools and a beautifully designed customer marketplace that allows you to have control over your business without worrying about security and data management because we do that part for you. Get In Touch Today To Learn More About How DBP Can Help Your Business Thrive! If you think our delivery software is right for you, take twenty seconds and apply to use it. You’ll notice we didn’t say “buy it.” We like to think of our process as more of an application. At the end of the day, we don’t want you to spend money on a delivery software that won’t work for your business — though, if you are in the home delivery industry centered around recurring deliveries of dairy, groceries, propane, water, or something similar, then we have a feeling a beautiful partnership is about to bloom! Let us know a good time to hop on the phone and allow us to earn your business as your dedicated dairy management and delivery software.